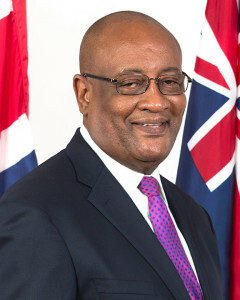 Minister for Health and Social Development, Honourable Ronnie W. Skelton has stated that the National Health Insurance, through pooled contributions, is not only more cost effective and affordable for the wider population, but will have significant long-term social and economic benefits for the Virgin Islands. Minister Skelton in response to concerns expressed about the economic viability of NHI, gave assurances that thorough research was conducted by certified actuaries and reputable health economists who examined data over the period 2005 to 2012 and made projections for forward years. He said new actuarial studies will be conducted every few years, and one is currently underway in order to ensure the decisions continue to be based on factual information. Minister Skelton stated that Government will not ‘pocket’ NHI contributions nor divert them to capital expenditure, as some have speculated. He also cautioned the community against being exploited by persons and entities with vested interests who may seek to manipulate statistics in order to further an agenda that is not in the Territory’s best interest. In response to recent assertions made by the Insurance Association of the BVI, the Minister suggested that a closer look at the data would shed light on how many registered clients are active, and the typical cost to insure a family under NHI compared to private insurance. In an illustration, he outlined that the monthly premium paid by Government employees under their existing health insurance plan range from $110.00 for employee only; $286.00 for employee and children; $330.00 for employee and spouse; up to $505.00 for employee and family. Additionally, each beneficiary is required to pay a deductible of $250 per year. He said under NHI, Government employees’ premiums would range from $52.01 per month in Grade 1 Step 1, up to the maximum premium of $247.00 per month. There is no annual deductible and no additional charge for children. It was also pointed out that attempts to make economic projections by calculating average earnings based on GDP per capita would produce skewed results that are not reflective of social and economic realities. These views were strongly supported by Professor Emeritus of the University of the West Indies, Health Economics Unit, Dr. Karl Theodore during a recent visit to the Territory. Dr. Theodore stated emphatically that private insurance companies were not only able to survive, but thrive in jurisdictions where the same model of National Health Insurance was introduced, by offering attractive supplementary packages. “I see no reason why the same thing cannot happen in the BVI,” Dr. Theodore said. What are the consequences for a resident when the lifetime maximum benefit of $1 million is reached? If the lifetime maximum gets maxed out by an insured, would the person still be required to pay the premium? What options would that person have to continue to avail medical benefits? Cases where persons have reached their maximum benefit with the National Health Insurance system will be reviewed and adjusted on a case by case basis, based on international best practices. Provisions are also made for adjusting the lifetime maximum benefit and other features of the plan, following periodic actuarial reviews. No one with the NHI system will be left without recourse, unlike with private insurance where, when the maximum is reached, the insurance contract is ended and the person is left uninsured. What reinsurance cover has NHI purchased? On 3rd September, 2015, the Social Security Board will issue a Request for Proposals to local insurance providers, affording them the first opportunity to bid on the provision of reinsurance coverage. Yes, members will be free to choose from among licensed practitioners that have contracted with NHI and are part of NHI network of providers. If the practitioner is not in network, then different rules will apply, as is usually the case with health insurance. What is the composition of the Medical Review Committee and how will it function? Will there be the capability for a patient to request a second opinion in the case of a rejection? The NHI Division will have a full-time Medical Director on staff who will appropriately handle all pre-authorisation requests as prescribed by the policy. The Medical Review Committee (MRC) will be comprised of two registered medical practitioners, a medical social worker, an Allied Health practitioner and a representative of the Social Security Board. The MRC will develop and monitor policies to govern overseas referrals and transfers, and will be consulted in cases where the staff medical doctor requires additional guidance. Mechanisms will also be put in place for emergency consultations to ensure that critical patients are transferred in the shortest time possible, once they have been stabilised to travel. Yes, there will be opportunity for second opinion, if so requested. As an unregulated body, will there be a complaints procedure or an independent ombudsman to handle complaints? The NHI will be regulated under the provisions of the Social Security (Amendment) Act, 2014 which sets out grievance procedures. The provisions of the Social Security (Decisions and Appeals) Regulations would apply. What staffing and systems have been set up to handle the volume of claims (including pharmacy) estimated to be a minimum of 200,000 per annum? Most claims will be dealt with electronically using the on-line, real-time, business-rules driven claims adjudication system. These will be managed and supplemented by the ‘benefits administration’ team at the NHI Office. Persons with relevant experience may apply to the NHI Office. Will you be providing an Explanation of Benefits to all Customers for every claim as secondary insurance cannot pay their share without Explanation of Benefits? Yes, the IT System will enable the timely production of Explanation of Benefits. What will happen to patients who will require more than 30 days hospitalisation or if they maxed out other benefits with limitation? These will be reviewed on a case by case basis. This is one instance where the opportunity for complementary private insurance may arise. Since children born in the BVI by non-belongers or non-residents will not be considered a BVI resident, the mothers would usually prefer to go to nearby islands like Puerto Rico or return to their country of residence for delivery. How will NHI handle this situation? Will they still be able to avail the maternity benefits since it is stated in the policy schedule that there will be no overseas maternity coverage? Persons who wish to access maternity care overseas may apply for a refund of out-of-pocket expenses up to the Usual and Customary Rates as prescribed by the Benefits Package. Such persons are encouraged to consult with the NHI Benefits Administration in advance.